WINNING DELIGHT!!! Western Regional Manager of Burger King and ardent Netball lover, Garth Sommerville (3rd left), along with coach of Corinaldi, Omroy Kerr (1st left), both look on as players from the successful team hold aloft their trophies including the winning one following their defeat of Flanker in the final of the St. James Netball Foundation Burger King Under-12 Competition on Friday at the Montego Bay Boys’ and Girls’ Club. 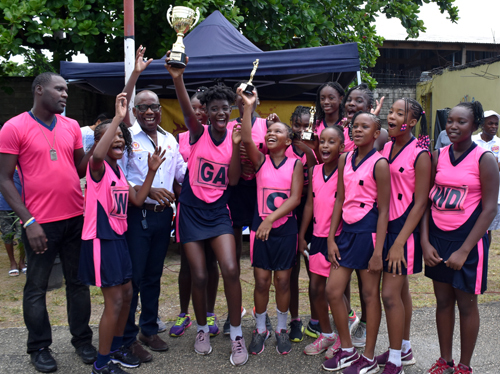 With their dominance and seeming air of invincibility showing no signs of ending, Corinaldi, for the 12th straight year, again lifted the annual St. James Netball Foundation/Burger King Under-12 Netball competition. In the championship game played in pouring rain at the Montego Bay Boys’ and Girls’ Club, the navy blue and pink-clad institution, guided by the dynamic duo of coaches Omroy Kerr and Jacinth Carey, came away winners over their fierce and spirited opponents Flanker, winning 18-6. It was a fierce battle in the early stages of the much-anticipated showdown, with the talented Flanker holding their own, unsettling the usually accomplished defensive line of the champions. However, Flanker kept off the scoresheet in the first quarter, failed to convert their pressuring plays into goals and conceded a goal a minute to trail 8-0 after the close of the opening 8 minutes. Flanker, tipped to topple the reign of the Corinaldi team, displayed a much better second and third quarter showing and better utilized the wet conditions, using their vast height difference, closing to within two (6-8) heading into the final quarter. Corinaldi, spurred on by their raucous coaches and some timely interceptions by gifted goalkeeper Jayla Shae Wright, wrestled back the initiave and placed a strangle hold on the affair with a 6-2 final quarter showing to seal the win and hoist the crown. Coach Kerr was delighted with the win as the school claimed an overall 16th hold on the crown and he told the Western Mirror that the hard work paid off. “It was another sweet victory for us. The players and coaches worked hard and in the end we reaped the success. Job well done,” he noted. Kerr revealed that some of the star players will be leaving, but was quick to point out that the talent pool is deep and rich, adding that players are ready to take their place.